Hello, everyone! It is Jessi from Kissin' Krafts! 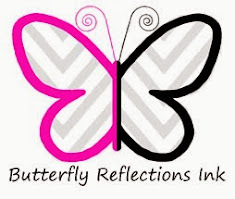 I am excited to be back on the Butterfly Reflections, Ink blog, today! I have joined the Bible Journaling community a few months ago. So when I saw that BRI carried the faith-based stamp sets from The Greeting Farm, I knew I had to get to work! For today's page, I choose the adorable Trust in the Lord stamp set. I stamped the angel image in the center of the column. The image is colored in using Neocolors and ZIG Clean Color markers. The phrases were stamped in black ink. The inside of the 'Lord' image is also colored in with Neocolors. I used a variety of blues and greens to create the scene around the angel. Water was used to blend the colors together. If you would like to see the Trust in the Lord stamp set and the other The Greeting Farm sets, check out this SECTION in the BRI store.